Terex Port Solutions (TPS) has received an order from Hans Lehmann KG (Lehmann) for a second diesel-electric G HMK 5506 variant of the Terex® Gottwald Model 5 mobile harbour crane. 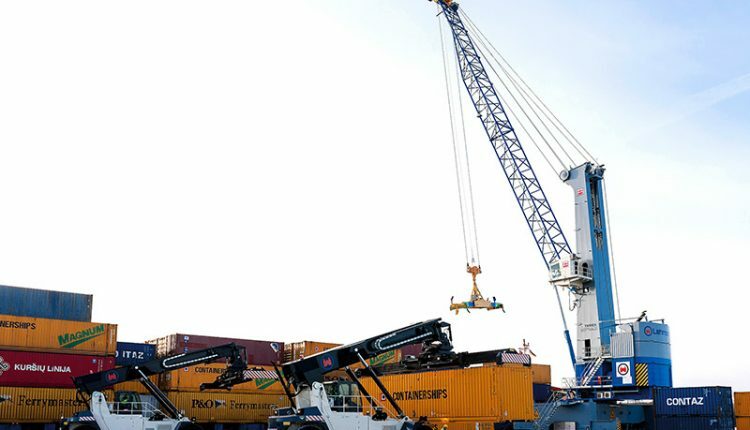 The crane will join an identical Model 5 crane that Lehmann has already been using successfully since the end of last year in Lübeck Cargo Terminal. The second crane extends the capacities and availability of ship loading and unloading equipment in the terminal, where three Terex® reach stackers have also been working since the end of 2013. Klaus Peter Hoffmann, Vice President & Managing Director TPS, sees the follow-up order from Lehmann as a double confirmation: “This renewed decision in favor of TPS indicates confidence in our technology. The order also shows that the Model 5 crane has been quick to find its market.” The Model 5, introduced in 2013, is aimed at terminal operators in need of a high-performance harbour crane equipped with the essential capabilities for standard requirements in terms of terminal infrastructure, annual hours worked and maintenance, at an especially attractive price-performance ratio. Model 5 cranes combine the functional and compact design of the medium-sized crane family with the even greater operational capabilities of the large crane family from TPS. As the largest machine of the medium-sized crane family from TPS, the Model 5 crane has an impressive lifting capacity curve with a maximum lifting capacity of 125 t, a wide radius of 51 m and maximum lifting speeds of 120 m/min. Equipped in this way, the second crane will also work primarily for Lehmann on the handling of vessels with up to ten container rows, but will also be used on project cargo vessels. The cab on the tower of the new crane is positioned slightly higher than on the first crane for Lehmann, enabling a 22 m viewing height for the crane operator. This makes loading and unloading even more comfortable, faster and therefore more productive. For handling on vessels up to post-Panamax class with still higher container stacks on deck, TPS has been offering its customers the Model 5 crane with a high tower variant since June 2014. As a result of the short-variant design being extended by 4.3 m, the boom pivot point has been increased from 16.7 m to 21 m and the viewing height of the crane operator has been raised to 26.3 m.